Assesses the Big Five dimensions of personality: Extraversion, Agreeableness (team orientation), Conscientiousness, Emotional stability, (resilience) and Openness in various situations (flexibility) and Situational perception. The B5PS is a multi-dimensional test that can be used on a modular basis. It assesses aspects of personality that are relevant to occupational success, and does so using a completely new approach. It considers not only personality traits but also the influence of the current situation in the form of the individual’s situational perception (monotony, expectation of results, vitality, cognitive load and mental and physical load). This concept is based on the recognition that the same situation can be perceived completely differently by different people and that in consequence people do not all behave in the same way in particular situations, even if they have similar personalities. Combining these two aspects enables the B5PS to provide the best prediction of success in the context of staff and management assessments and to facilitate comprehensive and targeted promotion of candidates in the context of staff development. In all forms of the test, situations that might be encountered at work are first described. 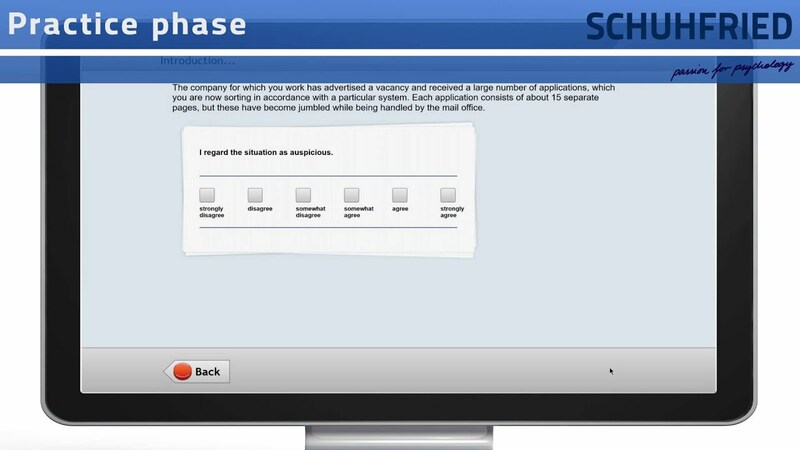 For each situation, test forms S1 and S2 require respondents to describe both their perception of the situation and their behavior on a six-point scale. In the modularized form S3 and the screening form S4, only their own behavior needs to be described. Each answer may be corrected once. Extraversion: Measure of behavioral tendencies in interpersonal situations (e.g. the level of sociability or assertiveness). Team orientation: Measure of social competence (e.g. the level of respect or trustworthiness). Conscientiousness: Measure of behavioral tendencies in the context of work or achievement (e.g. the level of discipline or determination). Resilience: Measure of control over one’s feelings (e.g. the level of stress tolerance or equanimity). Flexibility: Measure of the willingness to be open to new experiences and values (e.g. the level of tolerance or creativity). Expectation of results: The extent to which someone assesses a situation as rewarding or likely to result in success. Cognitive load: The extent to which someone assesses situations as challenging, complex or hard to grasp. Monotony: The extent to which situations are assessed as boring and uninteresting. Mental and physical load: The extent to which someone perceives situations as burdensome, stressful or strenuous. Vitality: The extent to which someone experiences a situation as lively and dynamic. On the basis of the combination of personality and situations, the scoring of the long form S1 includes a table showing how the respondent describes him- or herself in particular situations. Depending on the test form, approx. 7-70 minutes if all subtests are presented. Developed specially for use in personnel selection and development.